The mere mention of a monitor lizard can scare many people. Despite this, they can make a good pet for reptile enthusiasts, although it should be pointed out that it is not beginner-friendly. They are demanding when it comes to care and maintenance. You will need expertise to properly house a monitor at home and ensure its tip-top health. If you are interested in taking care of a monitor lizard, you should know that while there are more than 70 species that are available, not all of them are ideal as pets. To know more about its care requirements, keep on reading the rest of this post. The physical appearance of the monitor lizard will vary depending on their type. Among others, the ackie monitor is one of the most popular as a pet, basically because it is small, making it easier to handle compared to other monitors. Adults are two to three feet on average. The coloration can be yellow or red. If you are looking for a larger pet, on the other hand, choose the black throat monitor lizard, which can grow as much as six feet. They can also easily grow more than 60 pounds, so you will clearly need a large space. The Savanah monitor is another popular choice for a reptile pet. The average size is three to four feet long. The average weight, on the other hand, is 30 pounds. The basal coat is tan, and it is also considered as one of the most attractive monitors, making it popular as a pet. 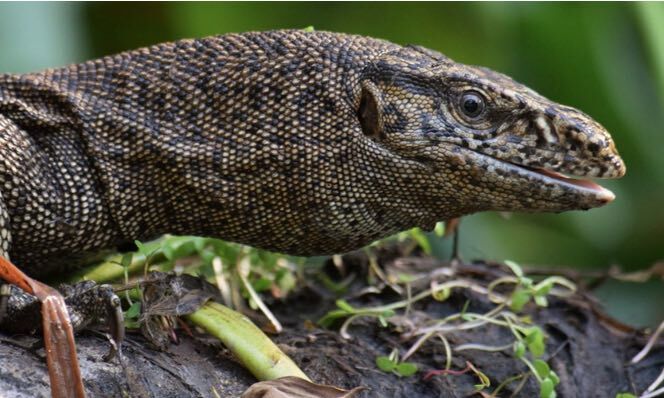 While there are other species of monitor lizards, most of them share the same physical characteristics, which include long necks and strong limbs. They also have sharp claws. Most of the time, their tails are half of their body. Despite being large, many of the monitor lizards are known for being shy unless they are threatened. Once they feel unsafe, they will demonstrate aggressive behavior, often in the form of tail whipping, biting, and scratching. Most of the monitor lizards are often on the move as they look for food, search for mates, run away from their predators, and find shelter. They are also known for having a sharp vision. If you plan to take care of a monitor lizard as a pet, regardless of the type, they all grow quickly. With this, it is important that you have a large enclosure from the very start as it won’t take long before they will be able to outgrow the tank. At a minimum, the size should be 8×5 feet. Because they usually need a large habitat, most people build one on their own using wood and mesh, among other materials. Aside from the size, another important part of the housing is the décor. Branches and leaves should be present to make them feel like they are in a natural environment. They should be large enough so that they will be appropriate for the size of the monitor.
. It provides the ability to measure the temperature in a manner that is contactless. Ideally, the temperature should be 85 degrees Fahrenheit and 100 degrees in their basking spot. Monitor lizards are carnivores and insectivores. Many of them will swallow their prey whole. The specific foods that they eat, however, will vary in their size. Generally, some of the most common components of their daily diet include crickets, cockroaches, mealworms, shrimp, fish, mice, crabmeat, chicken, turkey, and eggs, among others. Commercial food in pet stores will also be a good part of their daily diet. While they are known for being hardy reptiles, if you fail to execute proper care and maintenance, they can be prone to illnesses. For instance, they can be prone to burns, especially when they get too close to the source of light. They can also suffer from calcium deficiency or over-supplementation, so make sure to keep an eye on its diet. Lack in calcium can weaken the bones and make the pet lose weight. Too much calcium, on the other hand, can poison the blood and can even result in death. These are pets that are not meant to be petted or handled regularly. They will become aggressive when you hold them. As much as possible, leave them on their own. They are known for being agile and smart reptiles, so be sure that they won’t be able to escape their cage. When you catch them, avoid holding them immediately as they will most probably resort into biting or scratching as a defense mechanism. Trim the nails regularly. The longer they get, the more they will hurt when they accidentally scratch you. However, especially if you are a beginner, trimming the nails is one thing that you should not do. It is best to consult with a vet.